As it draws closer to the eve of September 30—when three years earlier Russian military intervention in Syria first began—it is telling that Russia’s influence in Syria continues to grow on the ground and internationally, particularly through various de-escalation zones, the Astana peace process, and more recently the de-militarized zone in Idlib province. Syria was the first time that Moscow had launched a major military operation outside its borders since the end of the Cold War. Backed by Russian air power and Iranian militias on the ground, the Syrian regime has been able to topple armed opposition strongholds and assert control over all of the country’s major cities. While initially supporting its Syrian ally politically through the UN Security Council and economically through at-cost weapons deals, by adding its military support Russia dramatically turned the tide in favor of the Assad regime and changed the trajectory of the conflict. Moscow built up substantial ground forces throughout Syria. Estimates place around 4,000 troops on the ground including several private military companies (PMC)—ENOT Corp, “Wagner” and Morgan Security Group PMC—along with Russian military police with modern weaponry. Russia deployed its latest S-300 air defense missile system to ensure the safety of the Tartous naval base along with its navy ships off the Mediterranean coast in October 2016. It also sent three warships to reinforce its naval forces off the coast of Syria. Russian military advisors also trained and advised soldiers of the Syrian Arab Army (SAA), while developing relationships with pro-regime militias such as the Palestinian Quds Brigade in Aleppo and Jaber brothers militias (Desert Hawks and the Sea Commandos / ”Navy Seals”). Additionally, Russia was the driving force in the establishment of the Fifth Corps in November 2016—itmanaged and funded the group—which was deployed alongside other SAA units and foreign allied forces. In mid-2018, this unit consisted of pro-regime conscripts, volunteer militias created by the regime, Russians, and former opposition armed factions that signed agreements with Russia. 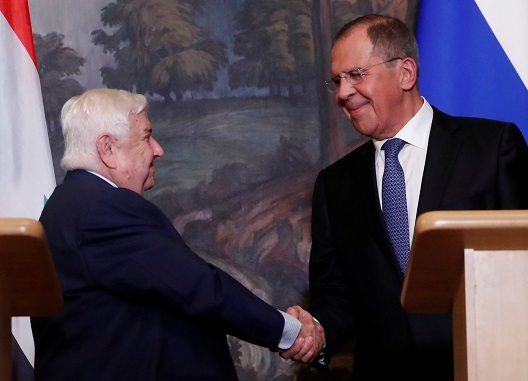 In August of 2015, Moscow and Damascus signed a deal allowing Russia to establish its Hmeimim airbase in Latakia province to launch its military operations. Over a year later, Russia ratified those agreements in October 2016 for permanent control of the strategic airbase and to deploy air forces indefinitely at the request of the Syrian regime. The forty-nine year agreement allows Russia to maintain the airbase and hold sovereignty over the territory as well as hold up to eleven warships including nuclear-powered ships and has option to extend it for another twenty-five years. Russia followed up months later in January 2017 with an agreement to expand its military presence through the naval center in the city of Tartous. It is an important asset as it is the only military base outside the former Soviet Union and its former satellite states with direct access to the Mediterranean Sea. This naval center boosted Russia’s operational capacity in the region, a long sought after goal. The Russian military expanded its small naval facility at Tartous to handle bigger warships and transport vessels amid a general buildup of Russian forces. Around 1,700 Russian military specialists deployed in mid-2015, which was a dramatic increase in personnel that until 2012 only amounted to a handful of military men and civilian contractors. The military expansion in Syria was part of a bigger Russian expansion that included establishing military bases in several other countries. In anticipation of the then military intervention against Idlib in early September, Russia consolidated its military presence off the coast of Syria with its largest naval deployment since the beginning of the conflict. More than twenty-five warships and support vessels and around thirty planes, including fighter jets and strategic bombers, took part in naval drills between September 1 and 8, according to the Russian naval commander-in-chief. On September 24, Moscow announced it would supply the SAA with the S-300 surface-to-air missile system within two weeks. The announcement came a week after the SAA inadvertently downed a Russian military plane when trying to shoot at Israeli jets carrying out an attack on Syrian military facilities. Putin personally honored members of PMCs, despite these mercenary firms operating without a legal framework. Private military contractors’ activities were outlawed by an article of the Russian Criminal Code prohibiting mercenary groups. However, in December 2016 Putin signed a legal amendment to Law No. 53 that permitted the deployment of Russian mercenaries around the world to augment the Russian military. The legality of these PMCs continues to raise concerns domestically for Russia on the extent of mercenary use in Syria. As the regime regained cities and territory through Russian and Iranian military support early 2016, statements by Putin indicated the military achieved its goals and called for the partial withdrawal of forces. Yet this initial announcement to withdraw turned out to be rhetoric. Reports showed a planned rotation of aircrafts and weapons for maintenance, not withdrawal. A year later, a similar claim was made in December 2017, and yet again Putin later stated the military would stay as long as needed. To date, a total of 63,012 Russian military personnel “received combat experience” in Syria, including 25,738 ranking officers and 434 generals as well as 4,349 artillery and rocket specialists, according to Moscow. Russia used its military intervention in Syria as “a way to showcase its weaponry for export sales,” especially their SU-34 fighter jet and cruise missiles. More than 200 new weapons developed by Moscow scientists had been used in Syria by February 2018, stated former Russian commander and now MP Vladimir Shamanov in parliament. Russia is a longtime ally of the Syrian regime dating back to the Cold War. Moscow’s commitment and support of Damascus from the beginning of the conflict is clear. Russia has continuously vetoed and blocked UN Security Council resolutions to impose sanctions and other punitive measures on the Assad regime. Moscow considers the possible overthrow of the Syrian regime as a major threat to its own regional interests. The removal of the regime could weaken its influence in the region while bolstering the position of the United States along with its allies; an unsavory outcome for Russia. The latest deal between Moscow and Ankara to create a demilitarized zone in Idlib’s province halted, at least temporarily, the possible regime offensive. It demonstrated once again Russia’s key role in the conflict, while making it clear that any action by the United States needs to take into consideration Russian’s interests in order to reach a viable solution. The military intervention allowed Russia to be the key actor in the conflict and its post-conflict reconstruction. It demonstrated Russia’s fundamentally new military and political capability on the international scene. Joseph Daher is an academic teaching at the University of Lausanne, Switzerland and author of the book “Hezbollah: the Political Economy of Lebanon’s Party of God” (Pluto Press: 2016).